Assuring that Sri Lanka, in its national capacity, and both as the Chair of the Abu Dhabi Dialogue (ADD) and the founder member of the Colombo Process (CP) - would endeavour in the best possible way to take the GCM processes forward, he emphasized the importance of the implementation of the Global Compact by all stakeholders. 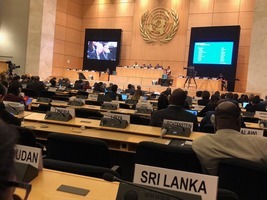 He further said that Sri Lanka looked forward to contributing actively to the discussion on the modalities for follow-up and review of progress in the Global Compact early next year. The GCM, Ambassador Azeez noted, was rooted in achieving SDG’s, adding that it was important to look at how effectively implementation of commitments could take place taking into account the respective regional dynamics and priorities. 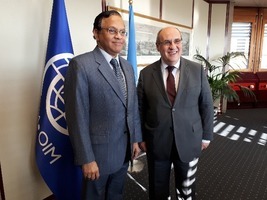 Calling on Mr. Antonio Vitorino, the new Director- General of the International organization for Migration (IOM) in Geneva, the Permanent Representative of Sri Lanka to UNO, Ambassador A.L.A. Azeez, stressed that Sri Lanka's long standing ties with IOM pre-dated its membership in that Organization, and assured continued cooperation and active support both in bilateral context as well as within multilateral fora, particularly at a time when the IOM was preparing to assume new responsibilities as the coordinator of the Global Migration Network with secretarial function for the Global Compact for Migration (GCM). Director-General Vitorino, welcoming Sri Lanka's active contribution to the common cause of global migration governance, particularly through leadership to the Colombo Process and now as the Chair-in-Office of the Abu Dhabi Dialogue (ADD), stated that as vibrant Regional Consultative Processes (RCPs), the Colombo Process and ADD had enriched the content of the final outcome of the GCM. 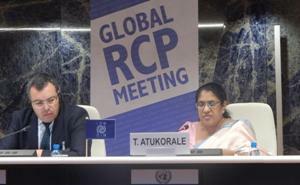 He expressed hope that Sri Lanka would continue this role, building upon the achievements made, to be a strong advocate for effective implementation of the GCM, during the Marrakesh High Level Meeting in December 2018, and also invited Sri Lanka to announce joint projects and proposals that could be supported by donor funding. He emphasized the importance of high-level participation at the Marrakesh Meeting. Ambassador Azeez remarked that the IOM enjoyed wide recognition in Sri Lanka as a UN Related Agency and that the IOM country office has been closely working with the relevant Sri Lankan agencies. He requested IOM’s support for enhancing Sri Lanka's labour mobility options, particularly through capacity and skills development, noting the need for economic and social empowerment of youth and women. The new IOM Country Representative- designate for Sri Lanka, Mr.Sarat Dash, and the IOM Advisor for Asia and the Pacific Ms. Wen Li were associated with DG- IOM, while Deputy Permanent Representative Mrs. Samantha Jayasuriya joined Ambassador Azeez at the meeting. 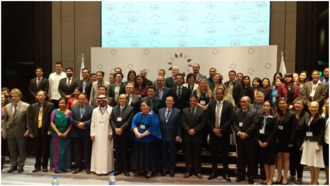 Sri Lanka participated at the Manila Conference on 'Future of Migration', and joined panel discussion sharing experience as the current Chair of the Abu Dhabi Dialogue. Ambassador A.L.A. Azeez, Permanent Representative of Sri Lanka to the United Nations in Geneva, met with the United Nations High Commissioner for Refugees (UNHCR) Mr. Filippo Grandi, at the UNHCR Headquarters, on 15 August 2018. Federal Councillor Simonetta Sommaruga, Head of the Federal Department of Justice and Police of the Swiss Confederation undertook a three-day visit to Sri Lanka, during which she called on President Maithripala Sirisena and Prime Minister Ranil Wickremesinghe. The main highlight of the visit was the signing of a Memorandum of Understanding between the Government of Sri Lanka and the Swiss Confederation on the establishment of a Migration Partnership. Minister of Telecommunication, Digital Infrastructure and Foreign Employment, Hon. Harin Fernando, emphasised that the Government of Sri Lanka accorded priority to increasing foreign employment opportunities for Sri Lankans in semi-skilled and skilled categories, with a clear focus on diversification of labour markets. The Minister particularly highlighted the long-term productive contributions made by Sri Lankan labour migrants to the growth of Sri Lanka’s economy. Minister Harin Fernando made these remarks during a meeting with Ambassador William Lacy Swing, the Director General of International Organization for Migration (IOM) and senior officials of IOM yesterday, 19 July 2018, in Geneva. The IOM Director General thanked the Minister for the excellent bilateral cooperation between Sri Lanka and the IOM and conveyed his appreciation for Sri Lanka’s leadership of Abu Dhabi Dialogue (ADD) and its contribution and stewardship in the recent past, of the Colombo Process (CP). Director General Swing stressed that these regional processes as well as other initiatives such as migrant health, migration governance, once they were combined and harnessed into practical and cooperative programmes, could help many countries to leverage migration for development gains. 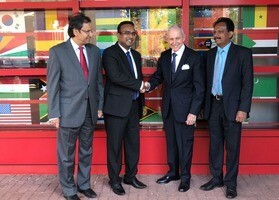 He encouraged Sri Lanka to continue to be active in these areas. 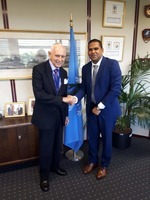 Permanent Representative of Sri Lanka to the United Nations in Geneva, Ambassador A.L.A Azeez, called on the Director General of the International Organisation for Migration (IOM) Ambassador William Lacy Swing. The IOM Chief commended Sri Lanka’s prominent role in promoting the Agenda on Migration Health, including by co-hosting the 2nd Global Consultation on Migration Health in Colombo in February 2017. The DG appreciated the statement delivered on behalf of the Hon. Minister of Health, at the recently held International Dialogue on Migration (IDM) in New York, which acknowledged the significant role that IOM was playing in advancing the SDGs. Highlighting IOM’s enhanced collaboration with the Government of Sri Lanka, with the undertaking of varied programmes such as post-arrival migration health, border management strategy, and support for Sri Lanka migrants abroad, Ambassador Lacy expressed satisfaction at the current level of engagement which he referred to as having “grown exponentially in the past few years”. He further complemented Sri Lanka’s Chairmanship of the Abu Dhabi Dialogue (ADD) and its long held leadership to the Colombo Process (CP), calling it “one of the most vibrant Regional Consultative Processes (RCP) of IOM”. Director-General of the International Organization for Migration (IOM), Ambassador William Lacy Swing, addressing the 108th Session of the IOM Council in Geneva, on Wednesday (29 November 2017) commended the Government of Sri Lanka for its leadership in migration issues and observed “our bilateral cooperation has grown exponentially over the last few years, but particularly in this year”. 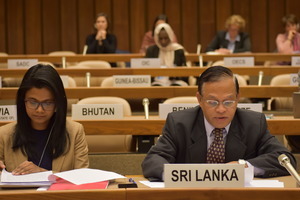 Referring to Sri Lanka's role in regional consultative processes - as until recently Chair of the Colombo Process (CP) and presently as Chair of the Abu Dhabi Dialogue (ADD), he thanked Ambassador Ravinatha Aryasinha for his leadership in steering a number of activities that has strengthened the relationship between the Mission in Geneva and the IOM. re-integration of refugee returnees, peace building and reconciliation and disaster management, Ambassador Swing expressed hope that IOM and Sri Lanka will continue to build on these excellent relationships. He also congratulated Sri Lanka on launching a comprehensive National Economic Development Programme; the Vision 2025 - A Country Enriched, under the leadership of President Sirisena and Prime Minister Wickremesinghe. He further expressed IOM’s appreciation for Sri Lanka’s co-sponsorship and for its contribution towards hosting the ‘Second Global Consultation on Migrant Health’ in Colombo in February 2017, and in actively supporting the efforts at securing the global attention on migrant health. The Abu Dhabi Dialogue (ADD), being mindful of the challenges that labour migrants face, is working together through programmes and initiatives to improve their conditions, in a manner beneficial to both the sending and receiving countries. 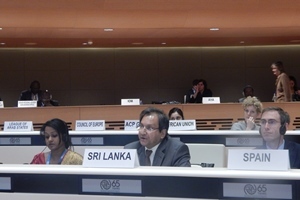 Deputy Minister of Foreign Employment Manusha Nanayakkara made these remarks representing Sri Lanka as the Chair of the Abu Dhabi Dialogue (ADD), while moderating session “Inputs and Recommendations on the GCM by Region Breakout Groups” on 10 October 2017 at the seventh Global Meeting of Chairs and Secretariats of Regional Consultative Processes on Migration in Geneva. The Director General of the International Organization for Migration (IOM) Ambassador William Lacy Swing expressed his appreciation for Sri Lanka's active role in the preparations for the Global Compact for Safe, Orderly and Regular Migration as well as the role in the Migration Health discussions during the meeting between Deputy Minister of Foreign Employment Manusha Nanayakkara and the Director General of IOM on 10 October 2017 at the IOM Headquarters in Geneva. 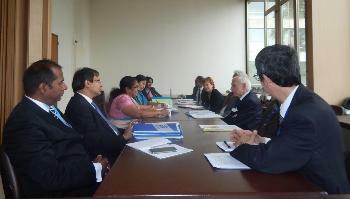 During the meeting, the two sides discussed bilateral cooperation between Sri Lanka and the IOM. 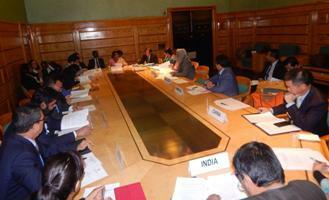 In particular, the Deputy Minister spoke of the training and capacity building requirements of Sri Lanka. 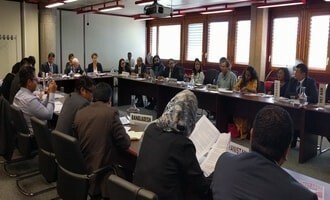 The Sri Lanka's Permanent Representative to the UN in Geneva Ambassador Ravinatha Aryasinha has called on Colombo Process (CP) member states to bring together consular representatives from Asian migrant sending countries in the GCC region, to share experiences and best practices in meeting the day-to-day consular support needs of migrants. 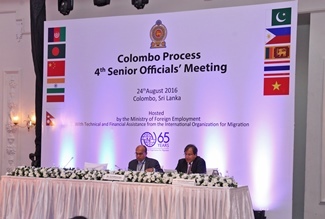 Noting that low and semi-skilled migrant workers from the CP countries in the GCC faced similar issues, and recalling the decision of the CP Ministerial Meeting held in Colombo in August 2016 to embark on ‘Consular Cooperation’ as a new thematic area among CP countries stationed in GCC, he welcomed the operationalization of this process through the recent convening of an IOM sponsored Migrants in Countries in Crisis Initiative’s (MICIC) workshop in Kuwait to address the emergency aspects of ‘Consular Support’. He urged that the idea to bring together consular staff from CP countries in destination countries should be replicated in other GCC countries as well, and must also focus on the day-to-day consular support needs of migrants and to collaborate with destination countries for mutual interest . Abu Dhabi Dialogue (ADD) convened a Special Workshop in Dubai from 4-5 July 2017, in operationalizing four key areas adopted in the 4th Ministerial Meeting held in Colombo early this year. Abu Dhabi Dialogue (ADD) chaired by Sri Lanka met in Dubai for a two day Special Workshop from 4-5 July 2017 at senior officials and experts level representing the member Governments of the ADD and including observers from civil society, the private sector, and international organizations. The main objective of the workshop was to operationalize the four (04) collaborative tracks that were approved by the ADD Ministers at the Inter-Ministerial Consultation in Colombo in January this year, namely, alternative model for labour recruitment, certification of skills and recognition, comprehensive information management and Technology in the Governance of Labour Mobility. The outcome will be shared with the ongoing UN Global Compact for Safe, Orderly and Regular Migration as ADD best practices in consultation with the ADD Members States. ADD represents one of the largest regional migration corridors. Please see the full report on the workshop proceedings. 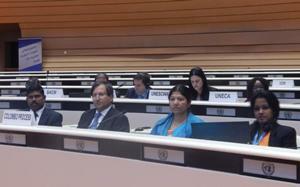 Sri Lanka’s Deputy Permanent Representative in Geneva Mrs. Samantha Jayasuriya said that ‘as a country with a sizeable number of its citizens working abroad, the Government of Sri Lanka places migration high in its national development policy’ and have made considered efforts to improve its national labour migration policies and governance, at national, bilateral, regional as well as international levels. 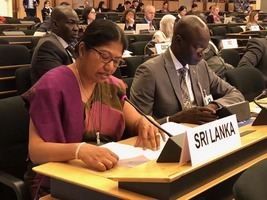 Highlighting the positive dividends migrant health agenda could contribute to both the individual migrants and to their host countries, Sri Lanka's Permanent Representative to the UN in Geneva, Ambassador Ravinatha Aryasinha emphasised that the Migrant Health be an essential element of the 2018 final Global Compact on Migration (GCM) document. Ambassador Aryasinha made these remarks during Sri Lanka’s intervention on 8th May 2017, at the first informal thematic discussion on development of the Global Compact for Safe, Orderly and Regular Migration, held from 8 -9 May 2017 at the Palais des Nations in Geneva, which focused on human rights of migrants, including their social inclusion and cohesion and all forms of discrimination, including racism, xenophobia and intolerance. 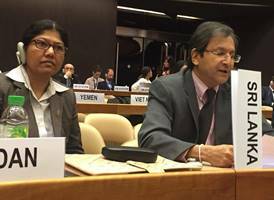 During the session, Sri Lanka also officially tabled the ‘Colombo Statement on Migrant Health’ adopted at the 2nd Global Consultation on Migrant Health, held in Sri Lanka from 21-23 February 2017, as an input to the GCM process. The Director General of the International Organization for Migration (IOM), Ambassador William Lacy Swing has commended Sri Lanka on its dynamism and perseverance as the Chair of the Colombo Process (CP) which has led to numerous achievements, and steered the CP to a progressive path and to a very good future. Noting that due to its regular engagement, CP is among the strongest Global Regional Consultative Processes, Ambassador Swing commended Nepal for taking up the leadership of the process, adding that the IOM stood ready to continue supporting the Chair of the CP. Ambassador Swing made these observations on the occasion of the transfer of the Chair of the CP, from the Government of Sri Lanka to the Government Nepal, during a meeting held at the IOM Headquarters in Geneva last week ( 29th March 2017). Participants from a cross –regional group of countries meeting in Colombo at the 2nd Global Consultation on Migrant Health, adopted the ‘Colombo Statement’, the first ever stand-alone political statement on the subject of Migrant Health, during the High Level meeting of the Consultation held on 23rd February 2017, under the patronage of H.E. 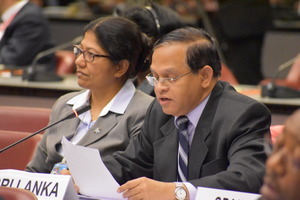 the President Maitrhipala Sirisena, and Chaired by Health and Indigenous Medicine Minister Rajitha Senaratne The statement adopted, was negotiated in Geneva under the Chairmanship of Sri Lanka’s Permanent Representative to the UN Ambassador Ravinatha Aryasinha with the representatives of the Permanents Missions in Geneva, following an the initial draft jointly developed by the IOM, WHO and the Government of Sri Lanka. 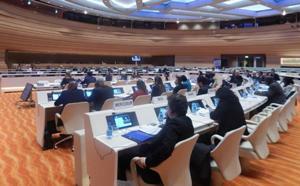 Switzerland, a co-chair of the UN intergovernmental consultations on the modalities for the process for adoption of the ‘Global Compact for safe, orderly and regular migration’, has commended the Abu Dhabi Dialogue (ADD) chaired by Sri Lanka, for its proactive action to seek close engagement in the process of development of the Global Compact on Migration (GCM). Mr. Pietro Mona, Deputy Head, Global Program on Migration and Development of the Swiss Agency for Development and Cooperation, acknowledged the leadership of Sri Lanka and the ADD troika, which also includes Kuwait and the United Arab Emirates (UAE), for initiating such a dialogue within the ADD, even before the resolution on modalities for the intergovernmental negotiation on the Global Compact was adopted by the UN General Assembly. The Director General of International Organization for Migration (IOM) Ambassador William Lacy Swing commended Sri Lanka’s dynamic leadership in Migration in connection with the important role played by Sri Lanka as the current chair of the Colombo Process. In particular Ambassador Swing highlighted the development of the five thematic areas ; Skills and Qualification Recognition, Ethical Recruitment, Pre-departure Orientation, Remittances and Labour Market Trends, under Sri Lanka’s chair of the Colombo Process. The International Organization on Migration (IOM) has expressed readiness to further enhance its assistance to Sri Lanka, by providing training and capacity building support for the Ministries of Foreign Employment and Foreign Affairs, and to the Sri Lanka Foreign Employment Bureau (SLBFE). It was agreed to extend cooperation in the areas of countering human trafficking and people smuggling operations, providing short-term internship opportunities with the IOM for the relevant officials as well as supporting the upgrading of the consular services of the Ministry of Foreign Affairs. 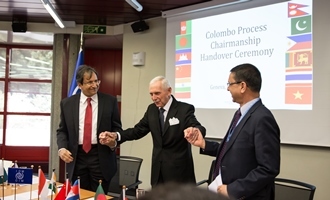 The IOM also pledged to continue technical and secretarial support for the Colombo Process (CP) - the regional consultative forum of contractual labour originating countries in Asia, currently chaired by Sri Lanka. These assurances were given when Minister of Foreign Employment Thalatha Atukorale who was in Geneva last week to attend the 6th Global Meeting of Chairs and Secretaries of Regional Consultative Processes on Migration met with the Director General of IOM Ambassador William Lacy Swing, to discuss and follow up progress on Sri Lanka’s bilateral cooperation with the IOM. Sri Lanka’s Permanent Representative to the UN in Geneva Ravinatha Aryasinha, Deputy Permanent Representative Samantha Jayasuriya, Counsellor Shashika Somaratne, and Acting Deputy General Manager of the Foreign Employment Bureau D.G.G.S. Yapa, were associated with the Minister. 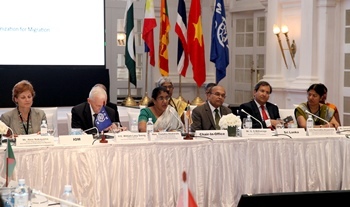 The Fifth Ministerial Consultations of the Colombo Process (CP) has decided to explore cooperation in the operationalization of the migration related goals in the SDGs, work towards promoting the health of migrant workers throughout the migration cycle, to focus on consular support for migrant workers and to promote equality for women migrant workers. These new thematic priorities for the group were elaborated in the ‘Colombo Process Ministerial Declaration’ adopted in Colombo on 25th August 2016, under the Chairmanship of Hon. 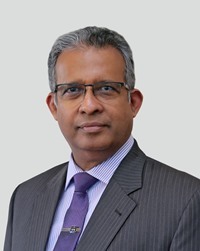 Thalatha Athukorale, Minister of Foreign Employment and Chair in Office of the Colombo Process. Mr. G.S. Withanage, Secretary/Ministry of Foreign Employment, Ambassador Ravinatha Aryasinha, Permanent Representative of Sri Lanka to the UN, Mrs. Samantha Jayasuriya, Deputy Permanent Representative and Ambassador William Lacy Swing, Director General/IOM and Ms. Nicoletta Giordano, Head/International Partnership Division of the IOM were associated with Minister Athukorale in the adoption . 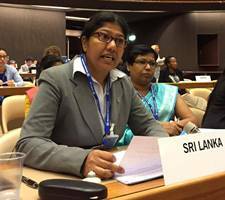 Sri Lanka's Permanent Representative to the UN in Geneva and Chair of the Geneva-based Colombo Process Member States Ambassador Ravinatha Aryasinha presenting a report of the Fourth Senior Officials’ Meeting of the Colombo Process Colombo, Sri Lanka, on 24 August 2016 has detailed the tangible achievements of Sri Lanka's Chairmanship of the Colombo Process over the past 3 years. Ambassador Aryasinha said the group had defied the conventional wisdom that the Colombo Process countries, in most instances being competitors, many of the issues that they had to grapple with were beyond the capacity of leveraging as a Group and that it must necessarily be a zero-sum-game. Under the theme "International Labour Migration for Prosperity: Adding Value by Working Together", Sri Lanka's 'road map' for its period of Chairmanship had taken on 5 of the toughest issues related to labour migration - qualification recognition, ethical recruitment, pre-departure orientation, Promoting Cheaper, Faster & Safer Transfer of Remittances, and enhancing the capacities of the Colombo Process participating countries to track labour market trends. The Colombo Process Technical Support Unit (CPTSU) had also been set up in Colombo in 2015 to support CP goals. The CP had also sought to strengthen engagement between CP countries and countries of destination, particularly the GCC countries, and also the EU countries.